A replacement unit obtained from AT&T apparently blew up on a Southwest Airlines flight, but the plane was still at the gate and, fortunately, nobody was injured. 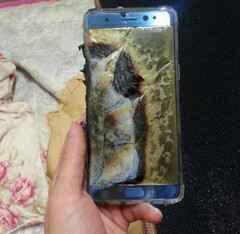 There is no doubt that 2016 is not a good year for Samsung, and the worst part is that the exploding batteries' nightmare seems to continue. After recalling more than 2 million Galaxy Note 7 units it managed to sell all over the world, the South Korean giant now faces the same problem with the latest phablet batch that was supposed to be safe. A recent report reveals that a Southwest Airlines airplane was evacuated before takeoff at the Louisville Metro Airport due to a replacement Galaxy Note 7 that started smoking and also burned through the carpet. Fortunately, everyone exited safely, the flight was canceled, and the plane did not suffer any significant damage. The U.S. Consumer Product Safety Commission just mentioned they are "moving expeditiously to investigate this incident" and, for now, the status of the "safe" Galaxy Note 7 units remains unchanged. Unfortunately for Samsung, the owner of the troubled Galaxy Note 7 mentioned above had enough and decided to replace his phablet with an iPhone 7.